Summer just got a whole lot cooler with this Citrus Rose-Ade. Citrus, roses, and vodka. How can you argue with that? Today I am sharing with you one of my favorite summertime cocktails, Citrus Rose-Ade. This flavorful citrus drink is sure to please any of your guests you are entertaining this summer. In fact, I served this beverage to my friends and family the other night along with a fun cheese board and my delicious red beet hummus. To make the rose-ade, you first need to make the rosehips simple syrup. I have used this syrup once before while making a roseships jam. It’s got that hint of floral that adds a great flavor and scent to this drink. Once the syrup is made and cooled, mix together the rest of the drink ingredients. I like to use about half a can of La Croix melon grapefruit to add a nice touch of carbonation and flavor to the drink. Depending on your pitcher size you can add less or more. To finish up, I like to add a sprig of thyme to each of the glasses. It’s a simple garnish that makes this drink look fancy! 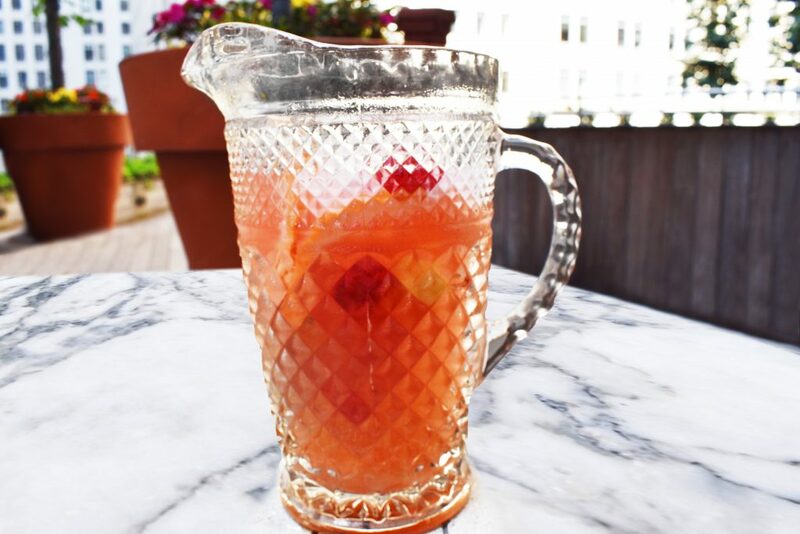 Check out the Recipe for Citrus Rose-Ade. Make this buttery beurre blanc sauce to accompany your favorite fish dish. Have you ever had beurre blanc before? It’s one of my favorite sauces to eat with fish, especially salmon. This french sauce (literally translates to white butter) is a hot emulsified butter sauce with vinegar and white wine. Almost like a Hollandaise sauce in nature, it emulsifies to form a beautiful and tasty sauce perfect for the addition of herbs to infuse flavor. To begin, reduce the white wine and white wine vinegar by bringing it up to a boil and simmering for a few minutes to reduce. Then off the heat whisk in small chunks of cold butter slowly. This will emulsify and create a luxurious sauce. I personally like to add some thyme and tarragon to my sauce to make it pop. What are you going to serve this sauce on? 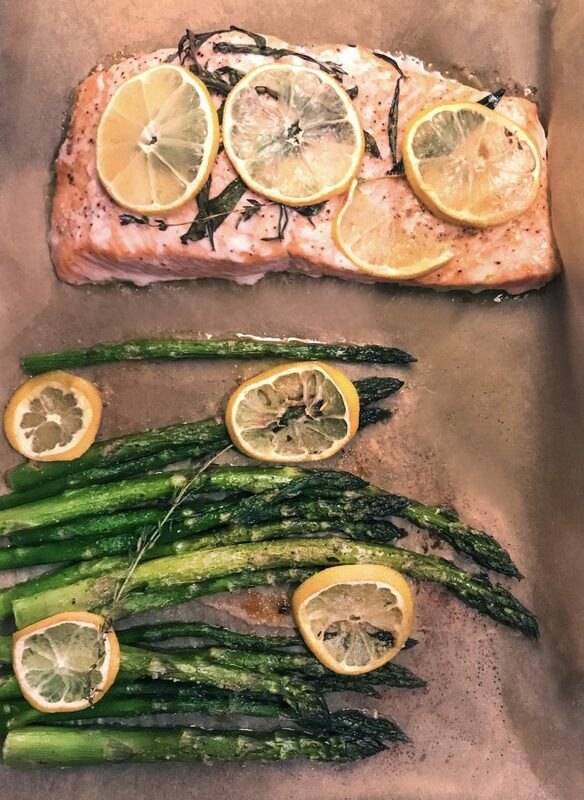 I recently made this Baked Salmon, a fast sheet pan meal, and decided that this beurre blanc would be an amazing addition. Want to try the recipe yourself? 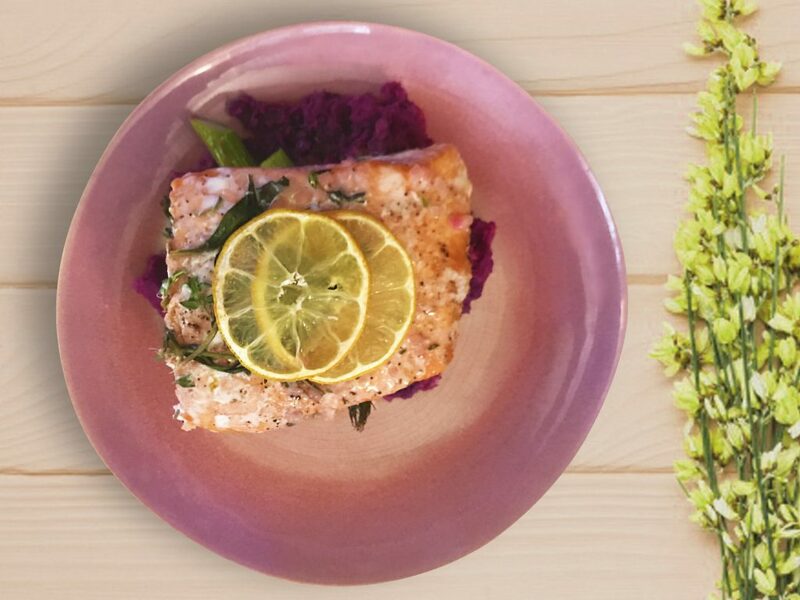 Get the recipe for Baked Salmon with Beurre Blanc here. Make this beautiful Seared Scallop dish for your next dinner party. If you know me, you know how much I love throwing dinner parties for my family and friends. Most recently we decided to enjoy some delicious seafood with this dish I created with scallops and mussels. First things first, locate all of your ingredients. I actually found sea beans at my local Whole Foods! Sea beans are in fact not from the sea nor are they beans. Makes me wonder why they are called sea beans at all. These little succulents are actually herbs that taste somewhat like salty asparagus. Once you’ve gathered all of your ingredients it’s time to start preparing your dish. I like to break my dish into components to make it easier to prepare. I first start with the watercress and parsley oil as the sauce for the dish. This can be set aside while making the seared scallops. When making seared scallops you need to make sure your pan is fully heated before you add your scallops. And be sure to wait to flip them over to ensure a golden crust. Nothing is worse than a soggy scallop. I decided to pair the scallops with some uni and mussels to elevate the dish. Doesn’t it just look lovely? 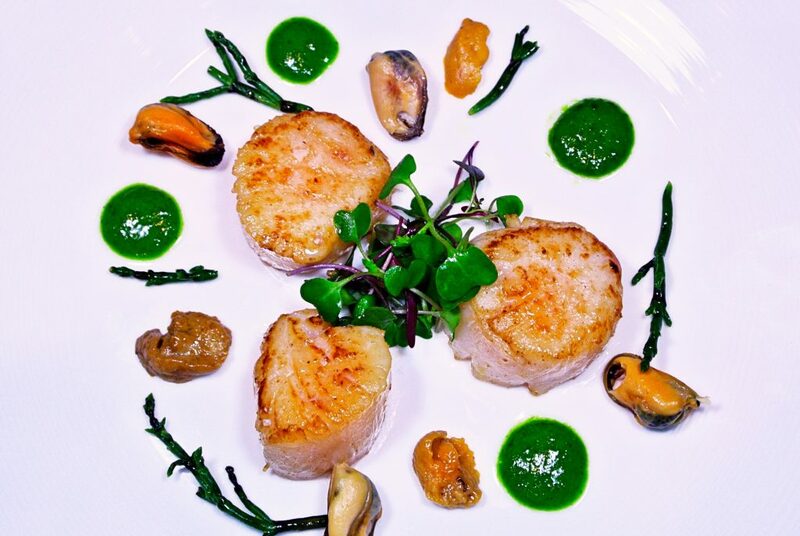 Click here to view my recipe for Seared Scallops with Watercress Oil and Sea Beans. There’s something about Lavender that makes me think of spring. Maybe it’s the floral scent. Or perhaps it the color that reminds me of Olivia’s spring time dresses. And what’s better to eat on a warm spring day than ice cream? Today I’m sharing with you one of my favorite ice cream recipes that I make when the sun starts warming up. I love the floral tine the lavender adds and the addition of honey and vanilla make this ice cream sweet and tasty. Finding dried lavender can be pretty easy. I usually get mine at the farmer’s market down the road but you can always get it online or even in your local natural foods store. Be sure to also pick up a fresh vanilla bean while you are there. The vanilla bean adds a great flavor that the extract cannot duplicate. 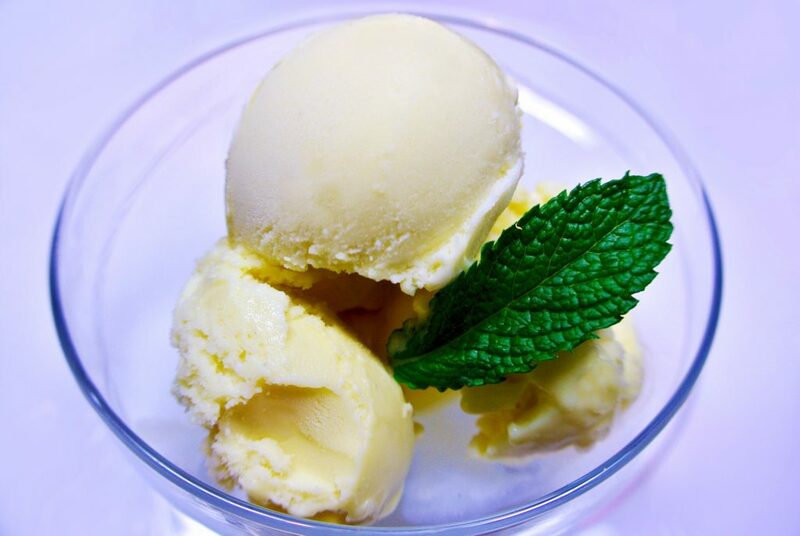 Grab your spoon and smile while enjoying this Lavender Vanilla Ice Cream. It’s easy for me to love New York City this time of year. 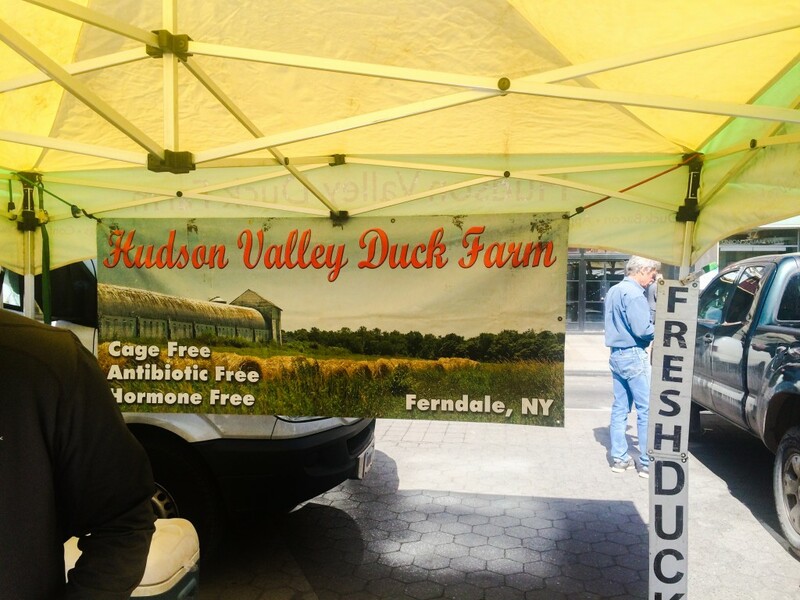 The chilling winds have subsided and the parks and sidewalks are blooming with spring flowers; but as a chef, there are few things more exciting than the return of the farmer’s market. Walking around the Union Square Green Market, the mixture of the warm sun, cool breeze, and colorful selection of fresh spring produce inspired me to create a salad utilizing game meat. I always love the selection at Eckerton Hill Farm and standing there with an armful of beautiful leafy greens I decided I would top the salad with seared duck breast and pickled watermelon radishes. 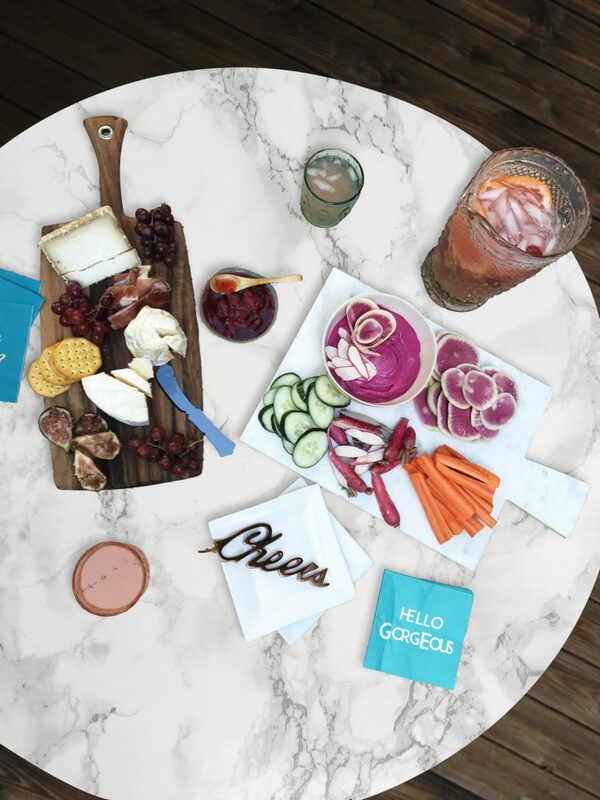 This farmer’s market inspired dish was an instant hit and was even featured on feedfeed! Click this image to view the Duck Salad recipe featured in our Fancy Made Spring theme! At Eckerton Hill Farm, I picked up a mixture of sweet spinach, mesclun, and Tatsoi. Tats has a similar flavor profile as mustard greens– spicy with a hint of sweetness. We wanted to continue the theme of spring and highlight its colorful and fresh ingredients with an all white table setting; it’s so clean and so fancy and just so us. The floral arrangement is clearly the main focal point on an elegantly blank canvas. The contrast between the pink, green, and white give the arrangement the perfect juxtaposition. 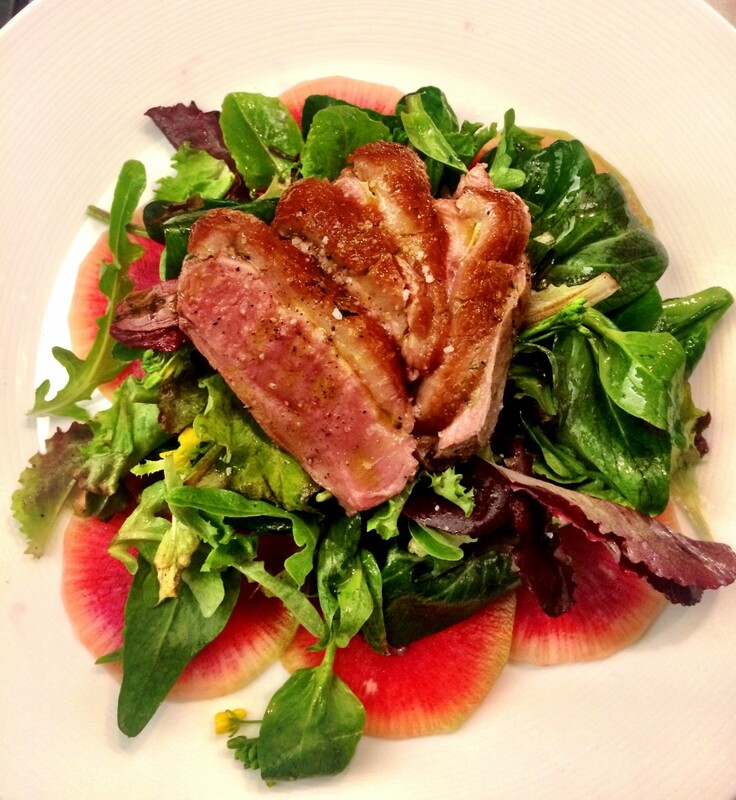 Not by coincidence the pink and green colors are also featured in our Spring Duck Salad. 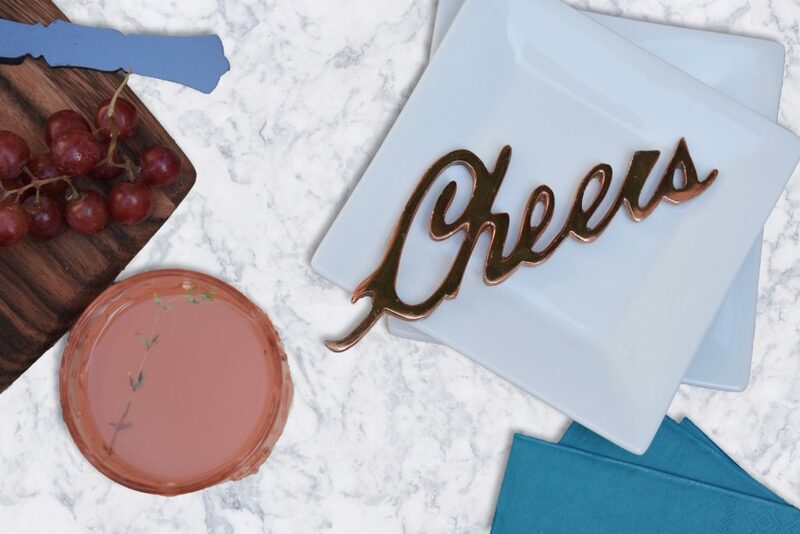 Our inspiration behind this dinner party is a renewal; to finally come out of the darkness of winter into the beautiful new beginning of spring. Since it is a celebration we chose to use our silver champagne chiller as a vase. It’s creative enough to impress your guests and is as easy to accomplish as taking your favorite conversation piece to your local florist. 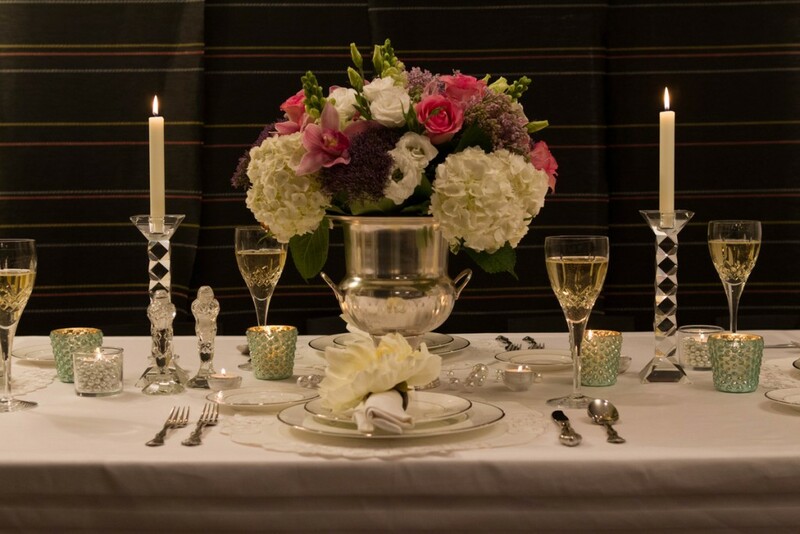 With white votive candles and white pearls scattered around the table we made sure to keep the spotlight on the spring bounty. Click this image to see all the items in our Fancy Made Spring theme!